lt;stronggt;SAF9560PClt;/stronggt;lt;BR/gt;Safco Triangular Lid For Trifecta Receptaclelt;BR/gt;Sleek, stainless steel triangular lid has laser-cut inscription to identify recyclables. Part of Trifecta flexible design with four receptacles sold separately, they offer a multitude of configurations to accommodate any workplace. Lid Type: Flat Top Materials: Steel Colors: Stainless Steel.lt;BR/gt;lt;BR/gt;lt;stronggt;KIM21271lt;/stronggt;lt;BR/gt;Safco Triangular Lid For Trifecta Receptaclelt;BR/gt;Soft and absorbent facial tissue. 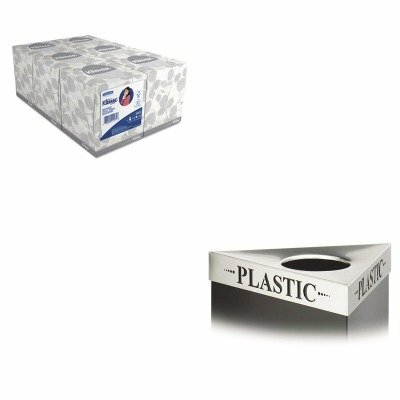 Our strongest tissue packaged for attractive presentation. Special feature lets you know when tissues are about to run out. Tissue Type: Facial Number of Plies: 2 Number of Sheets: 95 per box Length: 8 1/4amp;quot;.